At some indeterminate time in the past, and for some unrecollectable reason, Brownie Master P had the oven at 425°F and decided to bake some bacon along with whatever else he was doing (perhaps it involved brownies… who knows). It was decided that this bacon was “different” than other bacon previously made via the oven method. That brings us to the questions of “why”, “how”, and “how much bacon do we need”. Two slices of each type of bacon per trial was placed on a rack set in a sheet pan with raised sides. Rendered fat was extracted from the pan for later use, but paper towels could be used to reduce smoking and for easy disposal. The Roboshark reference did not actually specify the state of the oven, so we tried both from a cold and preheated oven. Bacon samples. 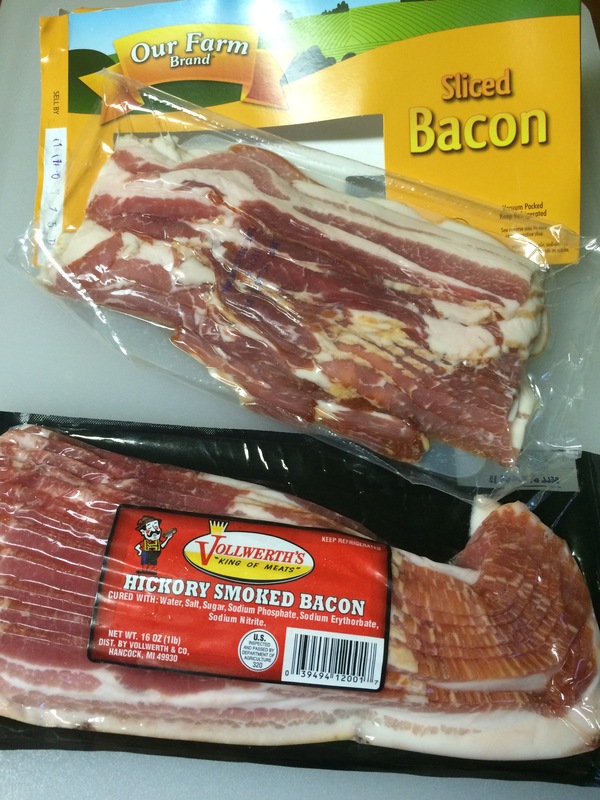 Vollwerths is our local, go-to bacon brand. Our Farm was the cheapest and most on-sale brand. 1 – less done T3. 400ºF for 12 minutes (preheated oven) meatier flavors than T1, meat portions of cheap bacon are more tender than T2. Finished bacon samples. See Techniques section for details. The top two techniques (tied for first) were partitioned based on bacon preferences (more/less done). 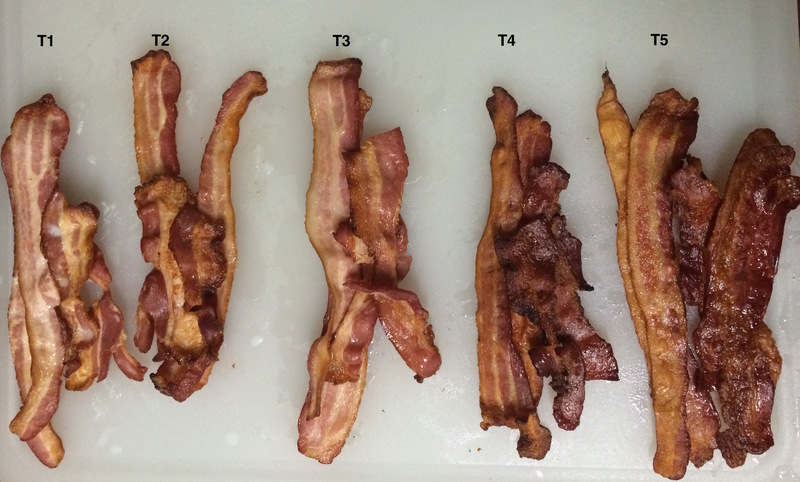 The relatively “low and slow” method (T5) produced the best results for those seeking crispy bacon. Flavors were well developed but there was no burnt taste. Daughter: You always overdo the bacon. Father: I do not. Twenty minutes, 400 degrees. I make perfect bacon. Mother: [kisses father] Yes, you do make perfect bacon. From our results, this comment is *highly* dependent on if the oven is preheated or not. Starting from a cold oven produced one of our favorites, but the preheated oven + 20 minutes = our least favorite, which while crispy, was also burnt. Our techniques used small bacon sample sizes. Does the amount of bacon cooked at once impact these results? For example, King Arthur Flour cooks an entire pound in one sheet pan. Additionally, we elevated all our samples on a cooling rack during the baking process, but King Arthur Flour placed their bacon directly on the pan – how/does that impact cooking results? Guess we’ll need to cook more bacon to find out – shucks. Brown, Alton. Good Eats. “Scrap Iron Chef’s Bacon“. Jan 9, 2002. Hamel, P.J., King Authur Flour: Flourish “Bakin’ the Bacon: Hands Off!” Dec 1, 2013. Roboshark. Dir. Jefferey Lando. Syfy. 2015. Film.